Our spaniel dog bowls are handmade to order for us by our lovely potters here in Britain. Shaped to make sure your spaniel's ears do not fall into the food or water, you can be sure to have a clean pup as well as a clean bowl after a meal! We also have matching regular dog bowls and treat jars so you can have the complete set. 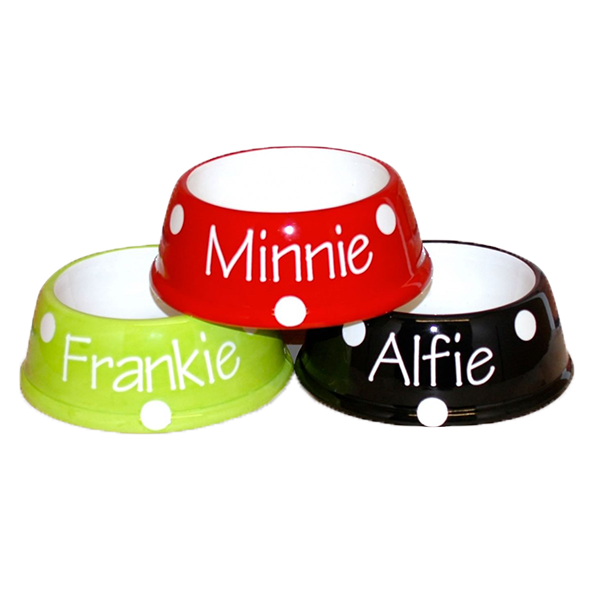 Our spaniel dog bowls can be personalised with your dog's name. At Chelsea Dogs, we know how to care for our longer-eared dogs and by designing a dog bowl with slanted sides, your spaniels ears will be kept out of the bowl. No more wet or mucky ears! Made from the finest ceramic exclusively for us, our Spaniel dog bowls come in some fun and stylish patterns and colours including paw prints, spots and stripes. For a small additional cost we can even personalise your spaniel bowl with your dog’s name before it enters the kiln. Our spaniel dog bowls are suitable for both food and water and they are dishwasher safe. With time, the glaze on our dog bowls will naturally start to show crack lines which really make these bowls very rustic and country chic.